I should warn you, there's a blog hop going on right now! A few of my fellow I'm Fit Possible ambassadors decided to join forces and, well...share posts! This is a good thing because all of us ambassadors, we share an interest in spreading the good fitness word in a positive and inspirational way. So today, I'm hosting Nikki from Grab Your Kicks. And she, on the flip side, is hosting me! (See how that works?) While I'm on her blog talking all about how running is more than just exercise, she's tempting my taste buds with the following recipe. 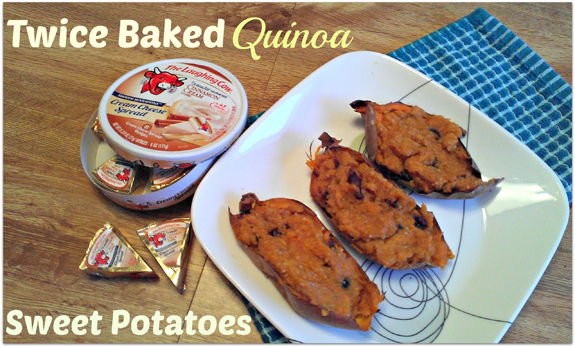 The first time I had a sweet potato, it was a couple of years ago at a Thanksgiving feast at my Grandma’s house. Needless to say, my mom and dad were not adventurous with food. My mom did her best, but it was usually meat and russet potatoes for the Peil family. That and a vegetable. Either canned corn or frozen beans. Now, one of my favorite complex carbohydrates is the sweet potato. I usually have them as a side, but sometimes they’re the main event. Besides being really tasty, sweet potatoes are high in Vitamin A, beta-carotene, Vitamin C and manganese. They help support good eye sight, fuel you for your long runs, and they help control blood sugar levels. I wish I could tell you the recipe below is some type of family secret, but honestly, I made it up this week! 1) Preheat oven to 375 degrees. Line a baking sheet with tinfoil and spray with nonstick spray. Bake sweet potatoes for 50 minutes or until tender. 2) Meanwhile, cook quinoa (I use Bob’s Red Mill) on stove in a small pot. Mix 1/2 cup of uncooked quinoa with 1 cup of liquid. You can use water or chicken stock. Set the stove on high. Once quinoa comes to a rolling boil, reduce heat to low and let simmer for 15 minutes with the lid on. Fluff the quinoa with a fork when done. The liquid should be absorbed by the quinoa. Use only a 1/2 cup of the cooked quinoa. You will have extra. 3) Once sweet potatoes are cooked, scoop out the flesh into a medium size bowl. 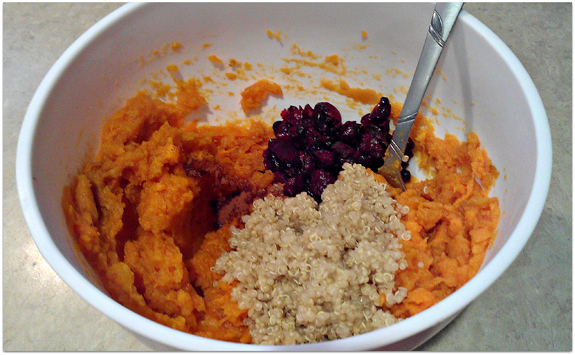 Mix in the cooked quinoa, dried cranberries and cinnamon. 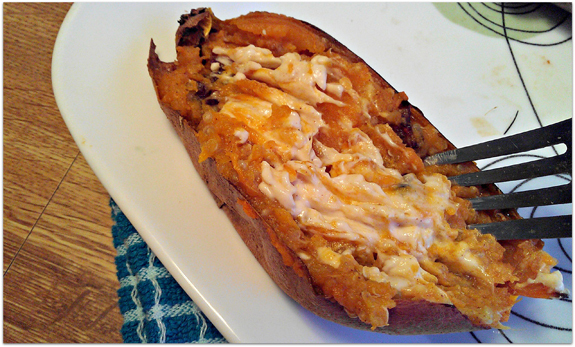 Fill sweet potato shells with the fleshy mixture. Cook for an additional 15 minutes in the oven. Let cool slightly, then spread with cream cheese and dive in! You could also top the sweet potatoes with walnuts or brown sugar. Use this as a fancy side dish at Easter, or throw it together in your sweat pants. It’s low maintenance and many ingredients are likely on hand. Nikki blogs about running, food, and life at Grab Your Kicks. She is a certified Group Centergy instructor and can be found on various social media sites including Twitter, Facebook, Instagram, and Pinterest. Too cute, have a great trip! oh my goodness, that sweet potato looks soooo good!